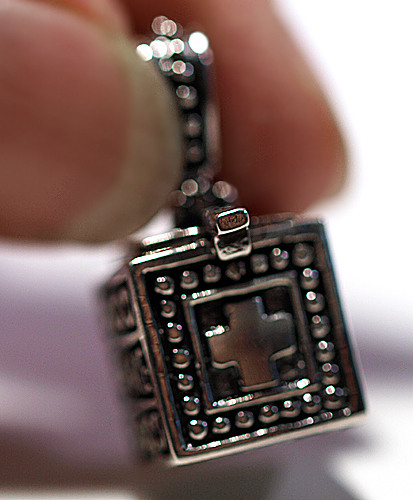 Dimensions (HxWxD): 1" x 0.437" x 0.437"
I fell in love with these Sterling Silver Prayer Box Charms when I first saw them and felt that they would be the perfect place to store prayers to the Divine. Wear it as a pendant and have your prayers resonate through the compassionate heart chakra. It would also work on a charm bracelet. A perfect place for a small powerful meditation stone such as phenacite or a small piece of tourmaline for protection. 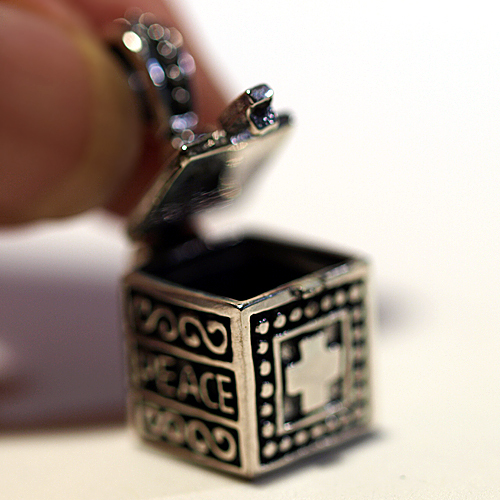 It has the word "Peace" and an equilateral cross motif on two sides each, respectively. The filigree work on this piece is quite unique & lyrical with a very distinctive ornate bale visible in the pictures here. This Sterling Silver Filigree Peace Cross Locket was created by the world famous Thai silversmiths; artisans known for their skilled & beautiful silver & gemstone works of art. Use this Sterling Silver Locket to hold your prayers within the delicate box-purse; use it to hold a small crystal, a child's first lost tooth or a lock of hair of a loved one. Note: weight above is shipping weight. Actual weight is 8 grams.